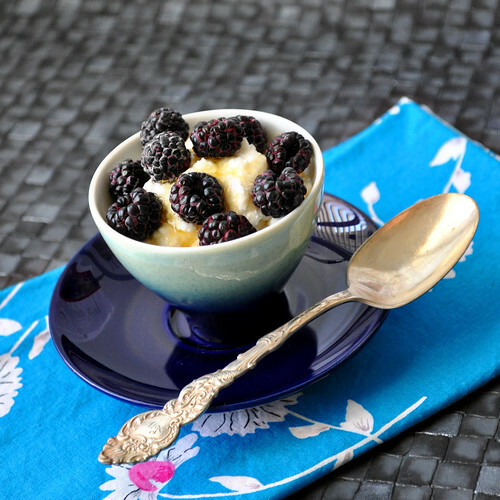 Remember a few months ago when I showed you how to make your own yogurt? 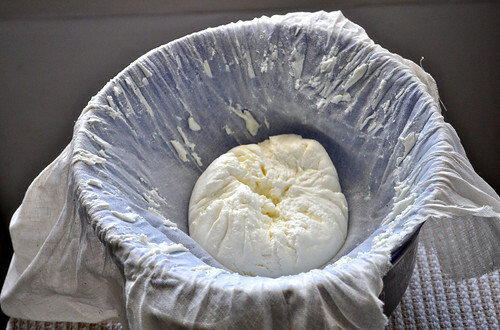 Well, this time I have something even easier for you: Homemade Farmers Cheese! I don't know how many of you know what this is, but it's something that I've had quite often growing up. On the weekends my mom would make sirniki, sort of dense cottage cheese like pancakes, that we would slather with sour cream and inhale for breakfast. Or we'd scoop some straight into a bowl, top with sour cream, honey and berries and scarf that up cold. While that's always been really good, this homemade version is even better. What you get from the store is always a bit dry, it really needs that sour cream topping to smooth things out, but the homemade version...I can eat that straight with a spoon. It's yet another one of those "one ingredient recipes" since all you'll really need is a great big pot of water and a carton of lowfat buttermilk. I have a feeling that you'd get the same results if you used a plastic jug, but I think you'd have a harder time getting your product out of it, so use the cardboard cartons, they should be easy enough to find. Step 1: Stuff an unopened carton of buttermilk into a large pot of water. It's okay if the carton floats, but make sure it's otherwise submerged. Don't be afraid to tip it on it's side; since it's not open, you'll be fine. Step 2: Cover the pot and bring the water to boil. Turn the heat off and leave the pot on the stove undisturbed overnight. Don't touch it, don't even think about it until the next day. Step 3: Pull out the carton and drain the curds in a colander lined with a piece of cheesecloth. Enjoy! For now I've just been eating it with a drizzle of honey and berries, but I think I'll need to tackle my mother's sirniki recipe with the next batch, so stay tuned! Do not use buttermilk in the plastic jug. It will leak into the water prior to the boil. Looking for a carton tomorrow! How long do you let it boil before turning off the heat? Just bring it up to a boil and turn it off right away. Leave the pot covered and where it is until the next day. Hope everything goes well for you! Thank you for posting such a simple recipe for tvorog!! I have been making it from a much more complicated recipe--this will be much better!